Hatshepsut is well known for her ambitious building projects in Egypt particularly the erection of several Obelisks’ at Karnack and her funerary Temple at Deir el-Bahri. In her time Hatshepsut was a model of feminine mystic, power and political acumen. Her accomplishments in ancient Egypt rank well when compared with , Queen Ferdinand of Spain, Queen Elizabeth 1 of England and Catherine the Great of Russia. After examining the contribution she made to the new Kingdom, historians generally agree this person was one of the greatest contributors to Egypt's ancient legacy in world history. 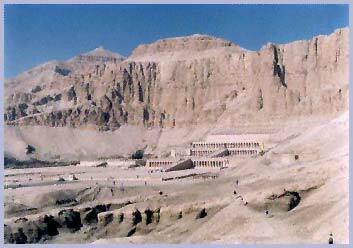 Hatshepsut's character and personal history is another story, this page is dedicated to her expedition to Punt. This expedition is an indicator of her leadership and skill in motivating and governing the Egyptian society of her time to high achievement. The story of Hatshepsut's expedition to punt is recorded for posterity in the Egyptian art on the wall of her memorial temple. The time slot for this adventure was 1480 BCE. Egypt was in the New Kingdom, had stable boarders, was recognized as the breadbasket of the Mediterranean. Egypt had recently successfully colonized Nubia and had a seemingly endless supply of gold coming into its treasuries from their southern allies. Egypt had 2000 years of high civilization under its belt, what could a girl do that was noteworthy. Egypt was capable of asserting its military power against any enemy if the situation required. This fact would be demonstrated by the Military exploits of Tutmohsis III who was Hatshepsut's co-ruler and predecessor. From her own account of things as recorder in her temple it appears Hapshetsut consulted her Gods and was told to follow in the footsteps of her ancestors and re-establish old trading associations that had fallen into the hands of middle men. Apparently for years the Pharaohs had been dealing with middle men to acquire trade commodities coming to them from the east and south through the Red Sea and eastern desert trade routes Between Luxor and the Red Sea. Hatshepsut's inspiration, recommendation and solution to this problem was to mount an expedition that would cut out the Middle man and go directly to the source of supply for many of these commodities. This plan required the organization of a fleet of seaworthy sailing ships and a military unit to make the expedition. Hapshepsut's task force was organized, launched and proceeded to meet their goals in bringing the trade goods of Punt to Egypt without the need for trade through middle men. 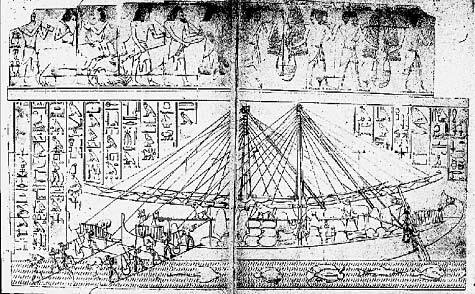 This page is dedicated to showing the ships used to make the journey and to discussing the implications of the use of Egyptian seafaring technologies at this time in History. Above is a model of a river barge used for transporting obelisks from quarries to the installation sites. These freight barges were the Egyptians primary use of displacement craft with wooden hulls. The ship building experience gained from building these types of freighters for the transportation of large scale building materials could have easily been transposed to the technologies applied in the building of sea-going vessels. Displacement craft of this type would have been used in the construction of the Pyramids. The need to transport large stones of up to 70 tons from remote quarries to the site of the pyramids would have required the Egyptians to have developed this technology when building the Pyramids. This means the technology and its application for building this type of ship was approximately 1000 years old by the time Hatshepsut built her fleet. Another indicator for this conclusion was the fact that Sahure had built seafaring craft and sailed the high seas in 2450 BCE and had recorded his exploits at his Pyramid complex. Sahure may have been one of the ancestors Hatshepsut had made reference to in her temple. It is clear that seafaring had been a regular undertaking in Egyptian history but needed a current champion to undertake a noteworthy expedition during this generation of Egyptians. Hatshepsut in her wisdom decided to champion the cause and record it for history. The ship illustrated above is the kind of vessel the ancient Egyptians would have used to in their trading expeditions to Punt and the African sub -continent. Below is a low relief placed in the wall of Queen Hatshepsut's temple at Deir el-Bahri. The walls of the temple are covered with reliefs and hieroglyphic records of the events and highlights of this trading expedition to the land of Punt, Circa 1480 BCE. These relief panels record a key event in Egyptian history. Relief showing ships which participated in the expedition to Punt. This mural and others adorn the walls of Queen Hatshepsut's temple at Deir el-Bahri. The petroglyphs of the Egyptian Eastern Desert provide the earliest record of the use of ships in the Egyptian culture. Some of these are dated to the Naquada I period but many of these are yet to be dated. Current research is trying to determine the dating and relevance the petroglyphs have to later developments in the use of ships in the Egyptian culture. Fortunately for the researcher Egyptian Art is replete with images of ships form the Naquada period to the Roman conquests. Egyptian art gives us evidence for the use of wooden boats from at least as early as the beginning of the fourth millennium BCE on scraps of papyrus which show part of a sickle shaped hull in which the paddlers appear to be sitting inside the boat rather than on of it, as would be the case if the boat was a reed raft. Wall panels a Sahure's funerary temple show evidence for the types of ships used at the time the Pyramids were built. By 2700 BC Egyptian civilization had developed economically and politically to the point that it was creating a powerful impression that found its expression in grandiose architecture. The transportation of building materials from quarries further up the Nile stimulated the development of substantial wooden vessels capable of transporting and supplying these new needs. In addition the temples and palaces were themselves part of an elaborate funerary cult in which special boats were used to transport the corpse to the Necropolis on the other side of the Nile, and, symbolically, to assist the spirit in its passage into the afterlife. The view of death as a passage across water is common to many cultures and in itself testifies to the importance of boats in those cultures. Drawings made as copies of the Egyptian Art reliefs recording Queen Hatshepsut's expedition to the Land of Punt. One the first oceanographic expeditions recorded in art history. Line drawing copy from a relief of Queen Hatshepsut's expedition to the Land of Punt. The Egyptian Sea going ships were apparently built in much the same way as river craft designed for transporting heavy construction material such as huge stones and obelisks. The earliest evidence for this comes from iconography of around 2450BC, which shows long slender hulls with considerable overhang, essentially enlarged versions of the river craft. The inherent longitudinal weakness of the reed raft inspired hulls was compensated, even at this stage, by the addition of hogging trusses running above the decks, and also by a substantial webbed girdling truss running round the hull just below the sheer strake which provided some lateral reinforcement to the hull. The best recorded examples of Egyptian seagoing ships at the height of their development are those built for Queen Hatshepsut's expedition to the land of Punt, which are depicted in considerable detail on relief sculptures at her temple at Deir el- Bahri. These ships from the mid 2nd millennium have much cleaner lines than earlier iconography of ships. These ships are clearly the product of nearly a millennium of refinement in shipbuilding techniques. Nevertheless the fundamental design weaknesses persist including the prominent hogging trusses and the 16 protruding deck beams necessary to pin the sides of a weakly framed shell built hull. There is no evidence apparent in the relief sculpture to show how the shell is constructed, but it must be assumed to embody the dowelling and dovetailing techniques found in the Dashur boats and later described by Herodotus. The stem posts of these boats are straight, but the stern curves round and is decorated with a lotus blossom, which is a common motif on Egyptian ships. Ships on Stamps (Hatshepsut's Ship) There are two large steering oars, one on each side at the stern, which are turned by tillers, which project downwards from the loom of the steering oar. The sail is much wider than on earlier ships but the foot is still supported by a boom and on one of the ships the yard has been lowered to the boom rather than the foot raised to the yard, which would be the normal way of furling a square sail. The yards are made of two long spars fished together with a pronounced curvature and two vangs or braces running to the ends of the yard rather than sheets attached to the lower corners of the sail manipulate the sail. This method of sail control is found in other ancient Mediterranean ships, including those with loose-footed sails whereas in Northern Europe the practice was to control the sail from the foot rather than the yard. The mast is stepped roughly amidships and the standing rigging consists of fore and backstays but no shrouds. 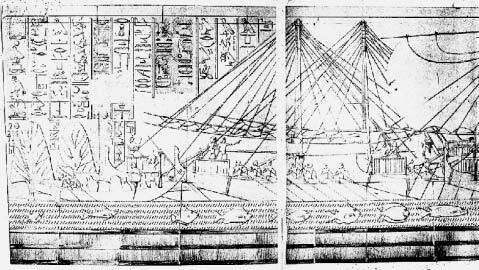 In addition to the sailing capability Hatshepsut's ships also have fifteen oarsmen on each side. Allowing for an inters calm distance between the oarsmen of just under three feet the central section of the ships must have been around forty-five to fifty feet in length, and the overall length may be estimated at around sixty to seventy feet. Copy from a relief recording Queen Hatshepsut's expedition to the Land of Punt. The interpretation of the conformation of Hatshepsut's ships from antique wall sculpture raises many problems. For example the sails are shown in a fore and aft position and though it may be assumed that such ships could go on a beam reach this would probably not be the normal sailing position. Also the artist has raised the waterline on the boats by about one foot. The cargo in these illustrations is shown stacked on the decks. This artistic license has been interpreted by some researchers as implying these ships were not watertight and, by extension, were really developed rafts rather than displacement craft. This seems unlikely, primarily because the general design and fittings of the ships are too sophisticated for a raft base, and secondly because artistic conventions in this and other pictures, requires that the cargo be displayed to the observer of the relief, cargo stored in a conventional hold would be concealed from the observer. Lastly it is impossible to make a determination of how the ships were built and how the planking was fastened from these, or from other roughly contemporary illustrations. The question of the method of construction is crucial to a proper understanding of the nature of these ships. The conditions met during journeys at sea would impose stresses on the hulls, which would not be encountered in a river environment. We can reasonably conclude that the Egyptians had extensive experience with displacement craft from at least the time of building the Pyramids and that Hapshepsut would have had the benefit of earlier experiences with the sea worthiness of ships to draw upon for the design of her craft. This fundemental record from Egyptian History of the ships of Queen Hatshepsut as recorded in her temple mark an apex in our knowledge of Egyptian shipbuilding in its unique form. 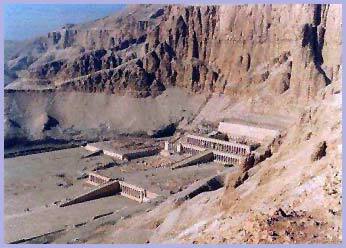 The accomplishments of Hatshepsut during her tenure as ruler in Egypt is one of the unique chapter in Egyptian History. Her legacy is even more monumental in light of the male dominated linage of Egyptian rulers.